Wedding season comes with its woes, like too much spending on clothes. Also, the fact that it coincides with the holidays and the gifting season doesn’t help with the budget. Hence, Pradhan’s Creative Collections in Bandra West will help you with your custom dresses for the wedding, that too on a budget. 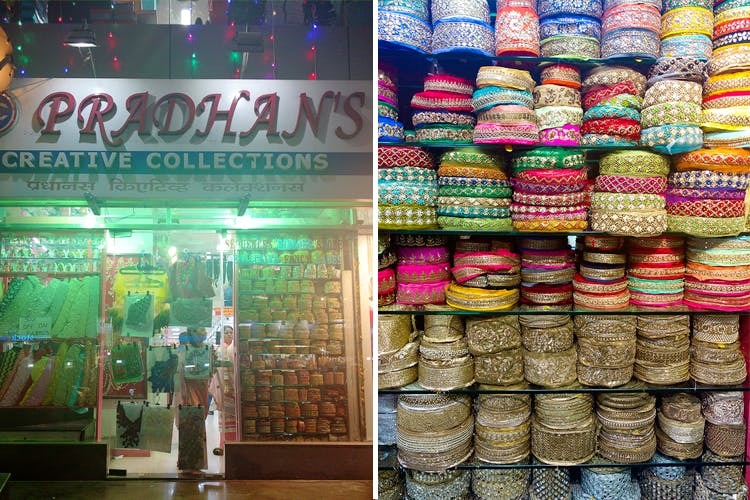 Pradhan’s in Bandra has a versatile collection of laces, latkans, patchwork, buttons, ribbons and other stylish dress accessories you can buy to revamp your plain outfits. So, all you have to do is get a beautifully fitting attire stitched with plain fabric and embellish it with the perfect accessories. They have a gorgeous collection of different variety of laces like GPO lace, embroidery lace, Parsi lace, handwork lace, cutwork lace, zardosi lace, sequence, gota, cotton, croatia etc. They start from INR 10 and go up to INR 1200. Apart from that, they have latkans that’ll give your dori the much-needed bling. The starting price for them is INR 20 and can go till INR 600. Do check out their patchworks, buttons and brooches. They are affordable and absolutely stunning! Feather lace is the recent fad in the market and they have an impressive collection of those. Also, their saree borders are awesome. Starting from INR 200 and going till INR 2000, they’ll give any plain saree an extraordinary transformation. Shopping for a wedding in budget just got easier. So, take out your favourite plain kurta or saree and get going!